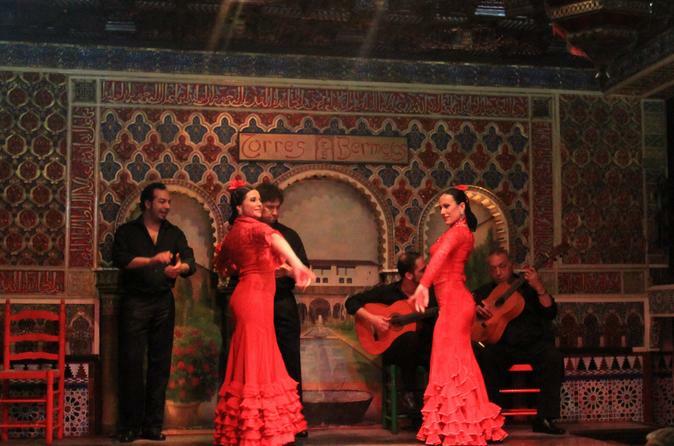 Transfer from your hotel to the Tablao Flamenco Torres Bermejas to see a magnificent show of Flamenco songs and dances, including a drink, tapas or a tasty dinner delight. Return back to your hotel. Transfer from your hotel to the Tablao Flamenco Torres Bermejas (previous confirmation), opened in 1960, the most important and unique in the world flamenco show. Torres Bermejas is unique for its stunning room that reproduces inside the Bermejas towers of the Alhambra in Granada with walls with Arabic motifs, tiles and wooden coffered ceilings, and home of the most famous Flamenco singers and dancers as Manolo Caracol, Camarón, etc, where you will feel a real ambience and see a magnificient show of Flamenco songs and dances, including a drink, Spanish typical tapas or a tasty dinner delight. Return back to your hotel.